“Piano Pieces.” Stefan KISIELEWSKI: Danse vive (1939); Prelude and Fugue (1942-43); Toccata (1943); Capriccio rustico (1951); Moto perpetuo (1953); Sonata No. 2 (1955); Suite for Piano (1955); Berceuse (1968); Three Stormy Scenes (1983). Magdalena Lisak (pno). Accord ACD 210-2 (1 CD) (http://www.cdaccord.com.pl/). 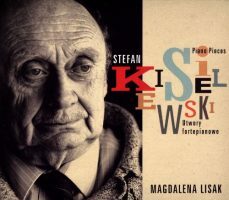 Kisielewski (1911-91) was not an apparent musical revolutionary, even though his novels and other writings got him into trouble with the Polish authorities. This portrait disc reveals a consistency across several decades, a witty composer who admired Prokofiev and Classical forms. The 1955 Suite contains two Preludiums, then a Minuet, Gavotte, Aria and Toccata. The early Prelude and Fugue takes Bach as a model. The earliest piece, Danse vive, perished in a fire during the Warsaw Uprising, but was reconstructed from memory by Lech Miklaszewski, the premiering pianist. Other works appeared to the world under pseudonyms: Berceuse originally had the name of Jerzy Mrugacz on it. Kisielewski’s last piano work, the Three Stormy Scenes, are consistent demonstrations of rhythmic vitality and clarity, slightly more haunting and intense than earlier works. 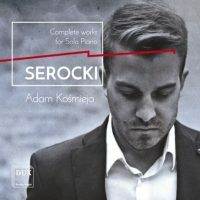 “Complete works for Solo Piano.” Kazimierz SEROCKI: Sonata for piano (1955); The Gnomes: Children’s Miniatures (1953); Suite of Preludes (1952); A piacere: Suggestions for piano (1962-63). Adam Kośmieja (pno). DUX 1284 (1 CD) (http://www.dux.pl/). Serocki (1922-81) studied in Paris and later in Darmstadt. His piano works do not reflect that he became a strong proponent of Polish Sonorism, primarily a coloristic orchestral style. The Sonata is a remarkable four-movement piece with propulsive speeding gestures, wide chords and acidic rhythms. As an accomplishment it stands assertively alongside Prokofiev and Ligeti for personality and expressive confidence. The Gnomes are small character pieces that use Polish folk music, much the way Bartók did in his pedagogic pieces. Even if “children” appears in the title, these are not easy. The Preludes are glinting miniatures, a somewhat cosmopolitan and sassy Bartók. Serocki handles the atonal style, somewhat new in 1950s Poland, with conviction. A piacere reflects Serocki’s assimilation of Darmstadt trends and it also consists of sections that may be played in any order. 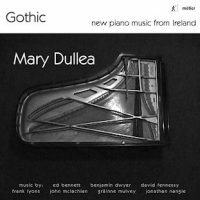 “Gothic: New Piano Music from Ireland.” Ed BENNETT: Gothic (2008). David FENNESSY: the first thing, the last thing and everything in between (2009). Jonathan NANGLE: grow quiet gradually (2008). Frank LYONS: Tease (2009). John McLACHLAN: Nine (2011). Gráinne MULVEY: Étude (1994). Benjamin DWYER: Homenaje a Maurice Ohana (1999). Mary Dullea (pno). Métier MSV 28549 (1 CD) (http://www.divineartrecords.com/). In Bennett’s Gothic, resonant notes tremble into being. Fennessy’s piece opens with two G’s spaced two octaves apart which every pianist knows. This short piece ruminates upon the Aria opening Bach’s Goldberg Variations while suggesting loss. The pianist must vocalize with long held “ahs.” Nangle’s contribution is short and relaxed; Tease requires live electronics as subtle interior sounds are coaxed from the instrument. The nine in Nine are bitty moments reflecting different impulses. The single-word titles come from multiple languages: e.g., Aurea is a jazzy post-serial American item; Fretta has moments suggesting a toddler’s unbridled discovery of the piano as noisemaker. Mulvey’s Étude blusters out of the gate before becoming a slowly paced study, then returning again to the opening perspective, but transformed. Dwyer’s two-part homage completes the program, enfolding a quote from Ohana’s guitar piece, Tiento. “Erik Satie: The Complete Piano Music.” Erik SATIE: Var. comps. Jean-Yves Thibaudet, Pascal Rogé, Jean-Philippe Collard (pno), Chantal Juillet (vln). Decca 483 0236 (6 CDs) (http://www.deccaclassics.com/). 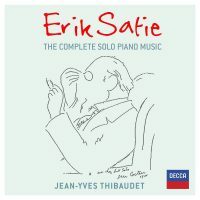 On five discs, Thibaudet offers all of Satie’s acknowledged piano music. The most popular pieces, which happen to be among the earliest, including the Gymnopédies (1888) and Gnossiennes (1890), begin the collection. The music hall pieces are mixed in with the calming Rose + Croix items and Vexations, also proceeding chronologically. The later pieces, generally the ones with the funny names, e.g., Préludes flasques pour un chien (1912) and Sonatine bureaucratique (1917), are in the middle, and the incidental music, such as Uspud (1892) and Le Piège de Méduse (1913), are grouped at the end. Thibaudet is matter-of-fact and perhaps brusque for some. The whole of Satie is more astonishing when one realizes the Wagnerian religiosity breaks an otherwise satiric and unpretentious flow. I’ve heard folks argue that there is not much to Satie, but other than the Vexations, he did not recycle much of his own, even if he did easily quote others (such as Clementi appearing in Sonatine bureaucratique). Indeed those years he spent brushing up on his counterpoint with Roussel didn’t diminish his attitude. The sixth disc, labelled a bonus, presents Rogé and Collard at various four-hand piano works. It’s good to have Parade (1917) in this set. The last tracks are for violin and piano: Choses vues à droite et à gauche (sans lunettes) (1914) which quite nicely doesn’t belong, but does, in a collection of complete piano music. “Starry Night.” Claude DEBUSSY: Estampes (1903); Arabesque No. 1 (1888); Golliwog’s Cake Walk (1908); “Les soirs illuminés par l’ardeur du charbon” (1917); Nuit d’étoiles (1880; arr. Koji ATTWOOD); Préludes, Book I (1910). Michael Lewin (pno). Sono Luminus DSL-92190 (1 CD, 1 Blu-ray) (http://www.sonoluminus.com/). 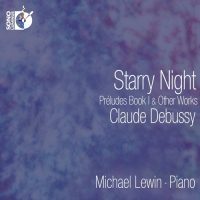 Lewin offers the first book of Préludes, preparing the listener with an introductory assortment of new and old. “Les soirs illuminés par l’ardeur du charbon” (after Baudelaire) is apparently an ailing Debussy’s last work for the piano, written to thank the coal vendor (M. Tronquin) who supplied the composer’s household during WWI. Nuit d’étoiles is an effective arrangement of a favorite song. Like an earlier release including Book II (http://www.lafolia.com/piano-factory-13/ ), Lewin’s Debussy is factual and appealingly unsentimental, e.g., La cathédrale engloutie is not lugubrious but quite visible from the water’s surface. “Insomnia.” George GERSHWIN: Sleepless Night (Prelude), “Melody No. 17” (1925; arr. Kay SWIFT, 1946). John CAGE: Dream (1948). George CRUMB: A Little Midnight Music (2001). Brian BELET: Summer Phantoms: Nocturne (2010-11). Bruce STARK: Urban Nocturnes (2014). Kai Schumacher (pno). Hännsler Classic 93.334 (1 CD) (http://www.haenssler-classic.de/). The Gershwin tune is taken on a worn upright which captures a speakeasy’s aura. Subtle piano artifacts lurk (inside sounds, buzzing resonance) in the Cage which might perturb traditionalists. Crumb’s piece intentionally straddles genres, being an exploration in and out of the piano on Monk’s Round Midnight. Bits of Debussy, Richard Strauss, Wagner, et al. litter the journey, along with the requisite loudly proclaimed counting. Summer Phantoms is decidedly a troubled dream whose electronics retreat before disturbing. 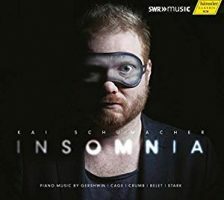 As the program moves chronologically, it also becomes more diffuse, although Stark takes us back to Gershwin and Cage’s tonality in his multi-section nocturnal landscape. 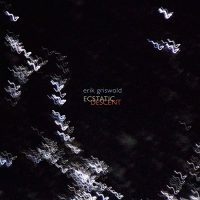 Erik GRISWOLD: Ecstatic Descent (2016). Erik Griswold (pno). Cold Blue Music CB0047 (1 CD) (http://www.coldbluemusic.com/). Every piano note is prepared in Griswold’s symphonic cavalcade. From the outset, the work settles into something like a waterfall, with rapid notes tinkling downwards, as the title suggests. However, around the midpoint something unexpected happens which to describe explicitly would break the spell of a startling 41-minute opus. Suffice to say, tendonitis is averted, and Griswold toys with memory and recollection, and what seemed like a process piece becomes suddenly introspective and melancholy. 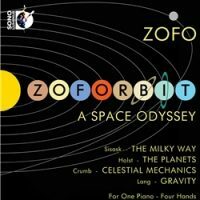 “ZOFORBIT: A Space Odyssey.” Urmas SISASK: Piano Sonata for Four Hands, Op. 24, “The Milky Way” (1990). Gustav HOLST: The Planets, Op. 32 (1914-16; arr. ZOFO). George CRUMB: Alpha Centauri and Beta Cygni from Makrokosmos IV, “Celestial Mechanics” (1979). David LANG: gravity (2005). ZOFO: Eva-Maria Zimmermann, Keisuke Nakagoshi (pno). Sono Luminus DSL-92178 (1 CD, 1 Blu-ray) (http://www.sonoluminus.com/). Calling themselves ZOFO, a gently distorted shortening of “20-Finger Orchestra,” this capable duo escapes Earth’s atmosphere starting with the Estonian composer Sisask’s two-movement four-hand sonata. Sisask uses a “planetal scale,” C#-D-F#-G#-A, in various permutations alongside zither-like interior sounds. The central offering is the well-worn Planets refreshing in ZOFO’s own arrangement where it’s easy to catch the Stravinsky and Schoenberg influences (Venus). Saturn and Neptune are especially eerie in this design. Alpha Centauri and Beta Cygni are a tantalizing selection, just two of the four pieces Crumb wrote for amplified piano four-hands. Like the Sisask, the physical interactions with the interior come through. Lang’s concluding gravity is a stately pavane with a subtle, continuously falling gesture.